You may be thinking about roasted vegetables, winter salads, waking up early to exercise and what not now that it's the New Year. But I'm still thinking about desserts. Specifically, I needed to find a way to use a partial can of sweetened condensed milk that was languishing in the fridge, leftover from some holiday baking. And it came to me in a lightbulb moment - why not make 7-layer bars using up stuff I have in the cupboard? It was a genius idea if I do say so myself, so I went in search of what I had on-hand that would also taste good together. I think I came up with a winning combination! 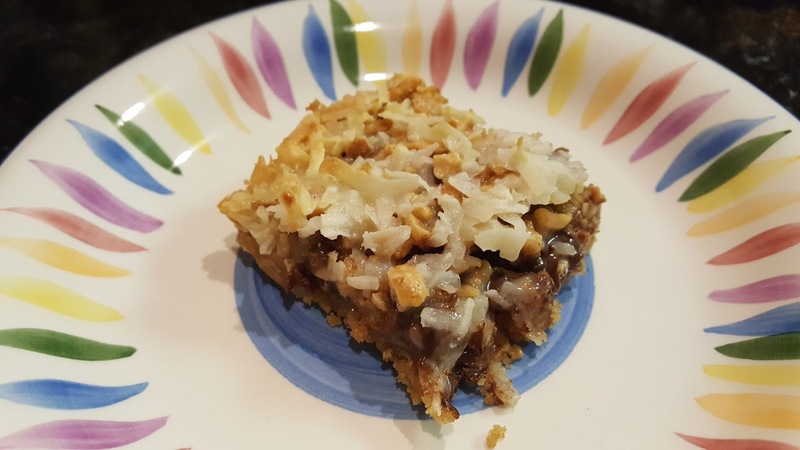 The 7-layer bar starts with a graham cracker crust and is eventually topped with coconut and sweetened condensed milk. Those are 3 layers. So now you have 4 middle layers that could use some creativity. I chose chocolate chips, caramel bits, toffee bits and peanuts. Peanuts may seem like an odd addition, but personally, I'm not a huge fan of pecans, which is usually what is in 7-layer bars. And I really love how the saltiness of the peanuts offsets the incredible sweetness of all the other ingredients. So there's my New Year's take on 7-layer bars! I hope it inspires you to come up with a new "treatment" for a great recipe sometime this year! Find more great ideas at Weekend Potluck, Awesome Friday, Full Plate, Wonderful Wednesday. Mix the melted butter and graham cracker crumbs until evenly coated. Press onto the bottom of a greased 8x8 pan. Sprinkle the chocolate chips on top of the crust in an even layer. Then top with caramel bits, peanuts, toffee bits and coconut. Drizzle the sweetened condensed milk evenly over the top. Bake at 350 for 25-28 minutes or until coconut is golden brown. Remove from oven and cool on a wire rack. Place in refrigerator for about 2 hours to help the bars set. Makes 12 bars. That sounds so good! 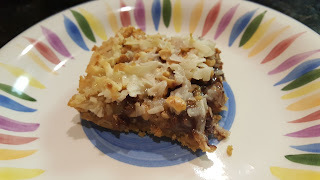 I love layer bars and this has the perfect mix of crunchy, salty and sweet. Pinned. Your 7 layer treat will be fabulous, Sara! Happy to see you here at Full Plate Thursday and thanks so much for sharing with us.